One of the 12 regional Federal Reserve Banks that, together with the Board of Governors in Washington, D.C., make up the Federal Reserve System. The St. Louis Federal Reserve Bank serves the Eighth Federal Reserve District which consists of Arkansas and portions of six other states: Missouri, Mississippi, Tennessee, Kentucky, Indiana and Illinois. 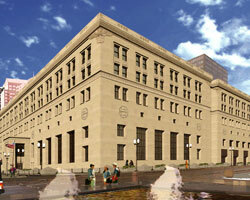 The St. Louis Federal Reserve Bank serves most of eastern Missouri and southern Illinois.